In order to connect your computer or laptop to the TV you must know exactly which jacks you’re dealing with. Component type connectors (RCA). The first two are useful for audio signal input from external sources (laptop, PC, MP3 player, DVD player, etc. ), the others are for entering video signal. 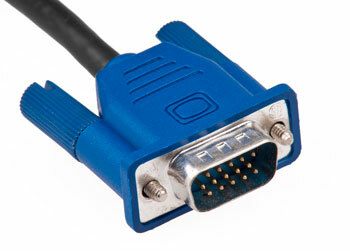 VGA connector for video signal input from a computer or laptop. Scart connector- connection for video and audio signals input devices that have this type of connectors. Digital Audio Out connector. This one allows the audio signal transfer via an optical cable to a Home Cinema system that allows establishing such a connection. HDMI connector for sending image and sound to another monitor, TV, projector, etc. 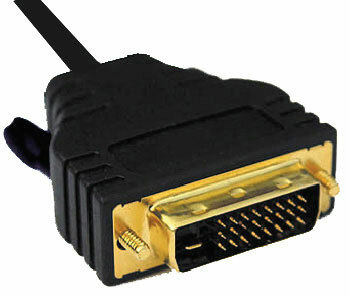 VGA connector for sending the image to a projector, television or external monitor (without sound). DVI (HDMI compatible or not) for sending the image to another monitor, TV, etc. Based on the connectors of the laptop /computer and the TV, you will need to purchase the necessary cable to make the connection. Ideally would be, categorically, that both the TV and the computer or laptop we want to connect to, have the same type of connectors. Otherwise, connecting the TV to your laptop or computer will only be possible using an adapter cable. 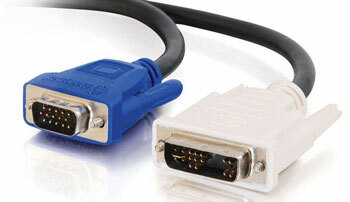 In cases where both devices have VGA connectors, the connection is created using a VGA cable. 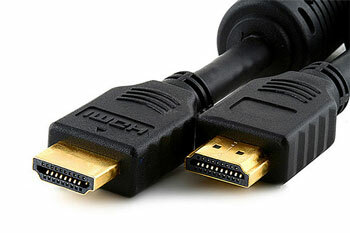 If both the computer (or laptop) and TV have HDMI connectors, the connection between them will be done using an HDMI cable. And the last case, where the computer (or laptop) and TV have DVI connectors, the connection between them will be achieved using a DVI cable. You may have a computer and a TV where connectors are not identical. In such cases, the only solution for transmitting the video signal from the computer to the TV, would be using an adapter cable. Cable adapters are of all kinds; for example, when the TV has only a DVI and the laptop has a VGA only, or vice versa, you have to use a VGA-DVI adapter cable. If your laptop only has VGA and the TV has only a HDMI connection, then you will need a signal converter that converts the analog signal the laptop sends into a digital signal received by the TV via HDMI. These converters are required to play content from an older laptop or desktop, on a newer generation TV. To begin with, have a right-click on Desktop, in a free space, then we click on Screen Resolution. This will the open the monitor control panel. If the TV was not recognized by the computer, in this panel we will see only one monitor. But that does not mean that the TV will automatically display the image from the computer monitor. For this, with the TV remote control, you have to select the source video signal that we want it to display (AV1, AV2, etc.). For optimal resolution setting, click on the icon that represents the TV, then choose the desired value on Resolution menu (only available by selecting the “Extend these displays” option in Multiple displays menu). For Windows 10, in search bar type mirror or project and select Project on second screen. It will show you a sidebar on the right and from there select how you want to project image from laptop to tv. How do we get to play sound from your laptop, through HDMI – on the TV? If you made the connection between the computer and the TV via HDMI, but you still hear the sound in the PC speakers, you must activate the correct sound source in the control panel. Right-click on the Speakers then pick “playback devices” then right-click on the device connected via HDMI to PC (monitor or TV), then choose from the list the option: Set as default device. If you only use the VGA connection that plays only the image, you need to use in parallel a Jack » Jack cable. One end will connect to the audio output jack (audio out, usually green) of the PC, and the other to the audio input jack on the TV.